Pacific Rim: Tales from Zero Hour will be complemented by mobile and DLC games prior to the film’s release. Warner Bros. Pictures and Legendary Pictures are preparing for the launch of Pacific Rim. 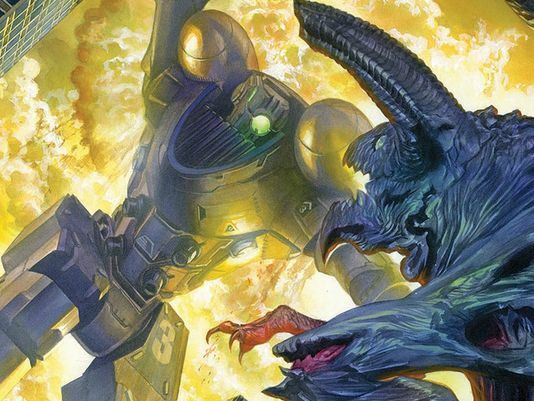 Fans of the new Guillermo del Toro film can read the backstory in the prequel graphic novel – Pacific Rim: Tales from Zero Hour. In addition to the film, there will also be mobile and DLC games to support the film, which Del Toro hopes will launch a new franchise (and additional games). Written by Travis Beacham, the screenwriter for the film, and supervised by director Guillermo del Toro, Pacific Rim: Tales from Zero Hour reveals the backstory of key characters from the film including Raleigh Becket (Charlie Hunnam) and Mako Mori (Rinko Kikuchi). Additionally, readers will see the first attack by the incredible monsters known as Kaiju and the tumultuous evolution of the Jaegers - massive robot fighting machines created by the humans to battle the Kaiju. Divided into three sections, the 112 page narrative begins in 2013, chronicling the very first time Earth is menaced by Kaiju - inhuman beasts that rise from the ocean depths and threaten to extinguish all mankind. Following the Kaiju invasion, the race begins to develop the Jaegers, each one controlled simultaneously by two pilots whose minds are locked in a neural bridge. Included among the many previously unreleased details that can be found in the book are; why the Jaeger’s need two people to control them, the first Kaiju vs. Jaeger battle, how Stacker Pentecost (Idris Elba) saved the Jaeger program and the origin of the special bond with Mako, and much more. Pacific Rim: Tales from Zero Hour features del Toro's hands-on supervision, this volume is beautifully penciled by Chris Batista, Sean Chen, Yvel Guichet, Pericles Junior and Geoff Shaw; inks by Matt Banning, Steve Bird, Pericles Junior and Mark McKenna. The cover art was painted by Alex Ross.